It is vital to fit the correct size nozzle when servicing your Snugburner and an annual nozzle change is required. Why? the nozzle is almost the smallest in the world and the aperture increases with use, causing changed combustion setting, more smoke, less air and inefficient burning. We have seen several instances of burners and cookers damaged by the bigger flame from a larger size wrongly installed. The nozzles are not commonly available from heating suppliers, due to the rare size. The nozzles listed here are for Snugburners fitted in Aga all models (both the BI24 or Bolt-on Snugburner). 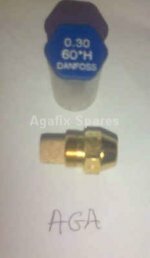 The nozzle is a Danfoss 0.3 x 60oH. Please note the spray pattern is narrower on the Aga burner.